This is it folks...the moment I have been waiting for...English singer/songwriter Paloma Faith has announced a title and release date for her highly anticipated sophomore record, the follow up to her successful 2009 debut, Do You Want The Truth or Something Beautiful? Just as she did with my with the release of her very first single, "Stone Cold Sober," Faith promises to re-capture my heart and my ear drums with her poignant lyrics, coupled with those rich, honey-coated raspy vocal stylings that grabbed me back in 2009 and haven't let go since. The new record, entitled Fall To Grace, is scheduled for release on May 28th via RCA and is preceded by the release first single, "Picking Up The Pieces," due out May 20th. AMAZING news. “I’d never really heard of Paloma Faith. I was living in LA when her record came out, so I kind of missed it. Sony/RCA called me and suggested I meet her when I was next in London. At lunch she sat and talked in such detail, as if every song was a short film, referencing everything from Chinese romantic cinema to Hip Hop. When I played the CD she gave me the songs flew out of my speakers! We got together and decided right away to embark on this journey. Man oh man. 2012 is shaping up to be a fine year in pop music, isn't it? 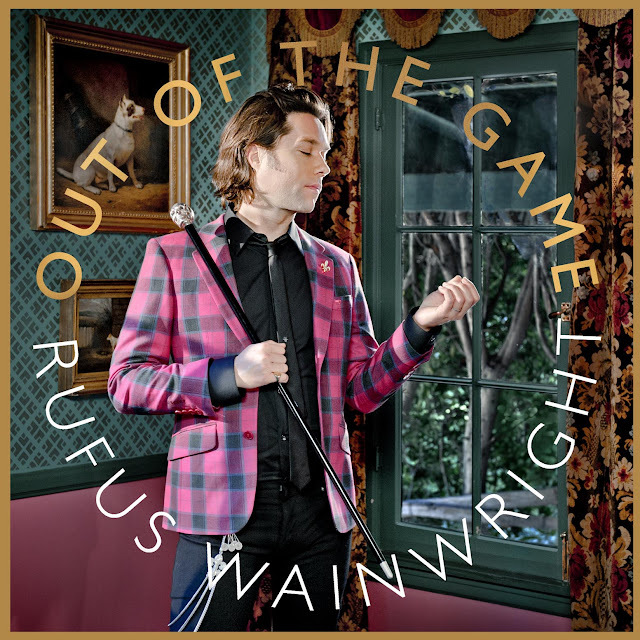 On April 23rd (May 1st in America), prolific American/Canadian singer/songwriter Rufus Wainwright will release his seventh album, Out of the Game on Decca/Polydor Records. Produced by the one and only Mark Ronson, Out of the Game is set to be "the most pop album" Wainwright has ever attempted and first single, the album's title track echoes those sentiments. The song starts out light and breezy with a distinct 70s feel to it, before moving into a big, rich, loud and beautiful chorus. While not as orchestrally-driven as Wainwright's past efforts, the instrumental is massively groove-worthy. An unlikely duo in many respects, the prospect of Ronson and Wainwright working together excites me to no end. Mark Ronson has an uncanny ability to bring out a completely different side of an artist and for my tastes, Wainwright is the perfect candidate for a reinvention of sorts. Don't get me wrong, I absolutely believe that Wainwright is a master at what he does, however his last couple of albums have been anything but commercial, which is a problem from a marketing standpoint. While I think the commercialism of an album is the farthest thing on Wainwright's mind while he's in the studio and writing songs, it certainly doesn't hurt his chances at increasing record sales and the likelihood of real chart success, something that has always been elusive to Wainwright. Here in America, Wainwright's last album peaked at #75 on the Billboard 200 and spawned a whopping zero charting singles. To date, his highest charting album remains 2007's Release The Stars, which managed to peak at #23 on the all important Billboard 200. Release The Stars also became Wainwright's best charting album in the UK, where it debuted at #2 on the UK Album Chart. Stateside, Wainwright rose to prominence with a couple of cover songs that appeared on popular soundtrack albums back in 2001, namely a cover of Leonard Cohen's often-covered "Hallelujah," which appeared on the Shrek soundtrack, and "Across The Universe" originally by The Beatles, which appeared on the soundtrack to I Am Sam (and later on his album Poses as a bonus track). I really believe that Wainwright owes a lot of his popularity and success here in the States to these two covers.